Setting up a dedicated email server is one of the most basic activities network servers are used for in business and organizations. In fact, just about every company that doesn’t outsource its email has a server that does nothing else but manage the email of the company going in and out. Ever since email was invented, there has been a need for a technology tool that could store multiple accounts, allow multiple feeds of data in and out, make backup files, and process communications in real time with multiple checks for status. A network server is the perfect tool for this electronic function, and many of today’s network servers are designed with the email function as a minimum capability. For a basic email server setup, the first step is to get all the physical components in place. This includes having a dedicated domain already established on the Internet. Second, a dedicated computer is needed for the server to be established on. The software that should drive the server can be one of a number of choices but Redhat Enterprise Linux is a common, minimum platform used. With the technology hardware and software in place, then the mail server needs to be configured to get communication operations and activity started. This is done by configuring the settings on Mail Exchanger, which is part of the Linux package used to operate the server. The details are carried in the software instructions, and it’s a very good idea to learn how to use Linux software in general before getting started. If not, then one need to at least have a good Linux guidebook on hand that can explain the software setup steps along the way. Of course, it’s not enough to have all the electronic communication software involved just working on a mail server function and nothing more. All that effort can be spoiled very quickly when the first connection happens and some kind of virus or hack floats in on the first email received; so basic filters and barriers need to be put into place as well to strip out this kind of garbage. That means installing tools like SpamAssassin, MailScanner, and ClamAV. There are other packages which may be just as good. Whatever the case, mail filtering and spam blockers need to be in place before a connection is made to the Internet. The final step is making the connection to the Internet. 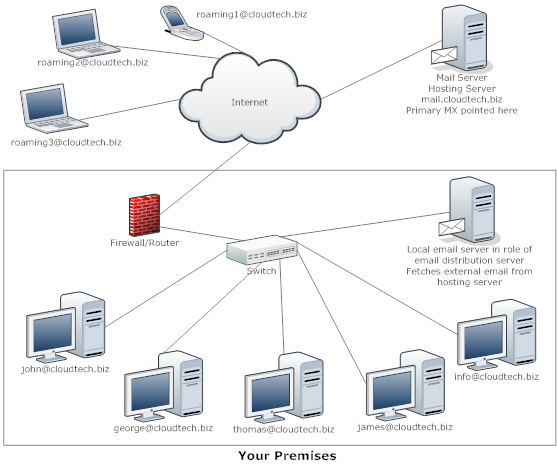 This is done by mapping and connecting web access to your email server. Some subtle changes will still be needed to tweak the server and get it working as best as possible, but the starting connection will now already be in place, moving email in and out of the server as long as it has a connection to the Internet. There are some very technical and fancy mail servers out there but they still follow the same principles as above in setup and connection.